At the beginning of this summer I was faced with a pretty lengthy list of long-range-to-do’s, one of which was “business cards(? )” (yes, I put question marks on my to-do lists…). After seeing business cards encouraged in many Hack Library School posts, and after realizing I’d probably want some for ALA, I decided it was time. But then I was faced with a myriad of options, questions, and debates. What should I include? Should I put my phone number or just my email? Should I mention that I’m still a student or just put something dorky like “aspiring information professional?” Here are some of the many factors that I considered; hopefully they’ll give you all some things to think about as you craft your own business cards. If you’re not afraid to get a little cutesy, might I suggest these lovely library-card-inspired business cards by Tower of Babel. Should I try to print my own or should I order online? This decision will determine many of your other decisions. It mostly comes down to timing, price, and skills: Is that big conference tomorrow? Then, yes, just print your own. Are you constrained by price? Many of us are poor grad students and, thus, the savings from self-printing seem pretty tempting. However, carefully judge whether it’s worth the chance of a dip in quality; essentially, do you think you have the graphic design chops to make sure your cards won’t look hopelessly simple and boring? If not, it might be worth it to order online; many sites have snazzy templates that add a level of professionalism. And there are a variety of sites, many of which have seasonal specials and deals that lower the cost pretty significantly (some examples are Moo.com and VistaPrint.com). What should I print them on? If you do choose to order online there are a variety of options in terms of the cardstock/card material itself. Glossy? Matte? Why am I being presented with so many options?!? This is pretty much a matter of personal preference, although keep in mind that certain materials cannot be written on as easily. And as Mark Sample attests in his piece on “Hacking Your Business Card,” writing an extra tidbit or contact info (such as your Twitter handle) on the back of your card is a great way to add a little value and ensure you are a bit more memorable. You should consider having more than one point of contact; include the ones you check most frequently. Also, for longevity’s sake, consider listing an email address that isn’t linked to your institution, since that will likely change once you graduate (go with Gmail or something comparable). Many people use Twitter for professional pursuits, especially in library & information science, so including your Twitter handle would not be out of place. Facebook? Probably not appropriate for your business card, as it won’t add much to your professional portrait. Tumblr or another blog? Maybe, if it focuses primarily on LIS issues or can showcase your writing skills in a way that won’t detract from your professionalism and employability. LinkedIn profile? Yes, if you have the space, and particularly if you don’t have any other online resume or web/blogging presence. In her post about business cards, Erin Dorney suggests including a QR code that links to your blog/website/LinkedIn page. Should I mention my school and/or my current position? I think it’s certainly appropriate to mention your degree and school. To maximize your card’s longevity, steer clear of “expected graduation” and other phrases that will become dated. Perhaps just list: “Degree, Institution, Graduation Year,” e.g., “MLIS, University of Illinois, 2013.” As far as a current position, I would hesitate to list it, especially if it is a student position or temporary appointment. You want to maximize the flexibility of your cards and pare them down to the bare essentials. Thus, consider finding a career path title or description that fits you best (e.g. “aspiring archivist” or “metadata expert”) or include a brief list of areas of interest (e.g. “Specialties include: technical services, web design, assessment”). Should I include an image or a photograph? It’s up to you whether or not you include a photograph of yourself; some people swear by headshots on their business cards, asserting that the photo helps ensure their memorability. You can also choose to include a graphic or image; just be sure that it’s your own image or, if it’s not, that you have the copyright clearance to feature it on your business card. Try not to throw in an image just for kicks. That goes for every element of your business card – it should enhance the overall product or you shouldn’t include it at all. Go forth, business cards in hand! Once you have them, use them! Conferences are the best place for business cards, so always come prepared and keep some everywhere – in your bag/purse/backpack and tuck a few in the back of your badge-holder! Strike a balance with your business card pushing; don’t be that obnoxious person who forces a card into every single person’s hand, but try to keep them in mind for when you meet new people in the field, even briefly. 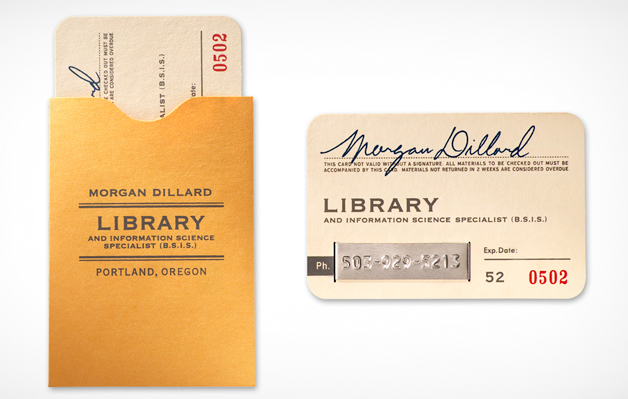 If you still need a little inspiration, check out these snazzy and creative librarian business cards: 5 Awesome Librarian Business Cards. And for a few more realistic LIS student business cards, check out these Hack Library School blogger examples: Annie Pho & Brianna Marshall. Share your library student business card tips in the comments! Staples online business card ordering. 250 cards can be had for as little as $4.99. it’s the same infrastructure underneath as Vistaprint but without the spam. cards look great, too! My personal cards just have my basic contact information. I didn’t put my degree or a tagline that says anything about me being a librarian. I did that because I didn’t want to change it when I switched jobs or graduated. I also did opt to put a random image on my card because when I give my personal cards to people, they remember me as the cat lady librarian (with the cats on her cards). One thing to remember is that when you get your first professional job, you’re most likely going to be given cards for your position with all the official work info. Usually, I carry both sets of cards with me at conferences. I use vistaprint (so far). I have my email, twitter handle, and tumblr URL (it’s professional, so it’s ok), plus my undergrad and masters degrees with just the year. They’ve worked quite well so far. With all the of job/internship-hopping that usually takes place while in library school, I wanted to make sure that my business cards wouldn’t “expire” in just a few months. I I know it’s going to take me 2 years to finish my program, so my title as a “Library & Information Science Graduate Student” at the Catholic University of America will hold me for that long. Like Annie, I also included a couple of personal touches on my card. The owl design signifies wisdom (at least in the Western World). I also added the famous quote by Thomas Jefferson on the back of my card: “I cannot live without books.” I figured it would be a quick icebreaker and give me an excuse to mention my Senior Capstone Project, which analyzed DC museum exhibit representations of TJ (including Jefferson’s Library at the Library of Congress). I thought it was important to link people to my resume, since networking is a big part of the LIS field. I included on the back of my card “Resume available at http://www.elizabethlieutenant.com“. This way, if anyone is interested, they can check it out; if not, no problem. While you don’t need to have a personal website, you should, at the very least, direct people to your resume on some platform, like your LinkedIn profile. As you mentioned, I’ve heard about some LIS students including QR codes on the business cards. It’s great way to show off your technical skills, but not good for people who have never used a QR code before (like me).